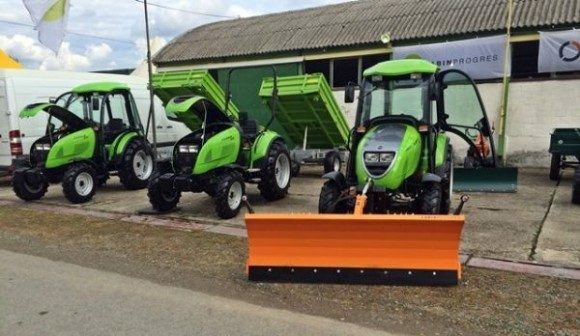 Company Entrada and company Labinprogres – TPS, traditionally have exhibited agricultural machinery program at the 23rd International Bjelovar Fair, the biggest event of this type in Croatia. With an astounding 40,000 visitors, and in the economic part of the exhibition nearly 500 exhibitors were from the Croatia and 11 foreign countries. Visitors interest was shown equally to Labinprogres small and large agricultural machinery. Beside the traditional motocultivator segment, visitors attention was especially attracted by tractor Tuber 40 and Tuber 50. On the domestic market Tuber tractors are recognized as reliable partners for a variety agricultural, activities, but also for communal activities. For this reason at exhibition was presented snow plough – working width of 2.00 meters, performed with the front tractor hydraulics. Public utility across the Croatian are been increasingly opting for tractor Tuber with attachment, in order to maintain the city, suburban streets and local roads. Labinprogres has launched a front loader platform who has found application in utility companies and in family farms. International Autumn Fair was an excellent opportunity to present one axle tractor trailers with carring capacity two, three, four tons. Trailers are recording major interest since its launch. Labinprogres – TPS continuous performs on Autumn as well at Spring Fair. Fair Gudovac is recognizable place, where on a quality way innovations can be presented, the possibility of direct sales, exchange experiences, retract new jobs and business contacts. Bjelovar Fair takes an important place in the International calendar of agricultural fairs in this part of Europe, planning significantly increase of exhibitors and visitors.